As opposed to the recycling process – which values the polymer, and not the actual product in its current form – Szaky's company work stems from the assumption that there's no such thing as garbage. Szaky creates value from what we throw out. 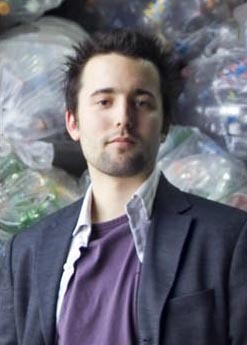 And his unusual concept has turned Terracycle into an $8 million company. Tom Szaky: Right now is the time for innovation. Everyone is freaked out, looking at ways to cut back. If you can grow and innovate in this market, there's a silver lining: Everyone else will be wiped out, and you'll be in a better position overall. Most people will tell you to hunker down, but this is an opportunity to do the opposite. Tom Szaky: We're a very open environment, and there's not much hierarchy. It's easy to share your ideas. Tom Szaky: We're in a hyper-growth space right now, so it's less about a specific exciting example. We're launching a product every three or four days. AB: What is the most difficult problem you and/or your team have solved? Were there any surprises along the way? Tom Szaky: When we launched our juice-pouch program, the initial sponsor was Honest Tea, which was very small at the time (this was before Caprisun). We got enough orders for 10 million juice packs that were due in four months. We were collecting the pouches slowly, and it would have been impossible for us to fill the order in time. Then we found a bunch of pouches sitting in a warehouse in Canada. Turns out someone had been collecting them. Tom Szaky: My key advice to a team is to lay out the problem step by step. Otherwise it overwhelms you. Let's take on one piece of it. Everything is solvable as long as you dissect it. Tom Szaky: The biggest obstacle is when innovation is not valued and not listened to. It's not that every innovative idea has to be acted upon, but it's important to encourage those thoughts. Tom Szaky: None. You come in, and you get used to it quick. AB: Do your innovations come from inside the company or from outside sources? Tom Szaky: We want to keep our work internal. Tom Szaky: All the inspiration I need comes from looking into a garbage bin. I just see that the idea of waste is the most untapped market out there. AB: What's next for you? Tom Szaky: Our next big thing is putting collection programs in front of major retailers. Petco has already started rolling out a Terracycle program in New York, where they'll collect a pet-related waste stream. We'll also be working with computer and mass retail stores. Hey, I am from Nepal. A day when I am completely thinking like Tom Szaky, I searched in the net and found a masterchoice interview I say the above one. Besides, in the place like Nepal where i don't have a good financial background and position with an ample of people who always are fond of pulling feets I don't even think of putting my innovative ideas into action.Anyways, like that one.